Equipping engineering students with the skills and knowledge required to be successful global engineers in the 21st century is one of the primary objectives of undergraduate educators. Enabling students to practice self-directed learning, to find solutions to design problems that are sustainable and to recognize that they are part of a global community are just of few of our educational goals. Self-directed learning can define an individual’s ability to practice life-long learning. It places the responsibility on the individual to initiate and direct the learning process and can enable an individual to adapt to change. Project-based learning provides the contextual environment that makes learning exciting and relevant. It provides an opportunity for students to explore technical problems from a systems-level perspective and to develop an appreciation for the inter-connectedness of science and engineering principles. In Materials Engineering, the model of a tetrahedron is often invoked to illustrate the bottoms-up connectivity of the fundamental principles associated with a material’s processing, structure and properties, which must be optimized to reach a desired performance. In addition, a top-down tetrahedron can be envisioned with the need for sustainability guiding the balance between economic, societal and environmental factors, which also influence the choice of the optimum design solution for a project. For students to fully explore this paradigm, it is imperative that project-based learning experiences be integrated throughout their undergraduate education. 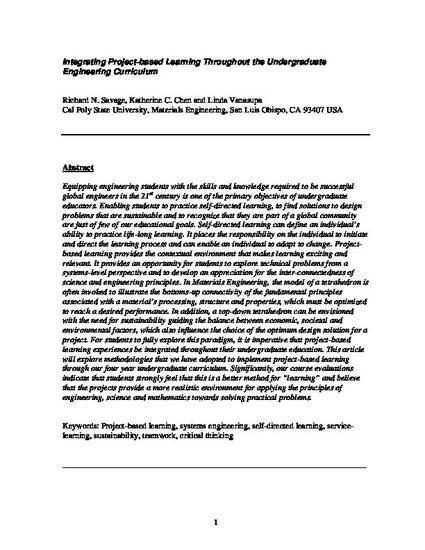 This article will explore methodologies that we have adopted to implement project-based learning through our four year undergraduate curriculum. Significantly, our course evaluations indicate that students strongly feel that this is a better method for “learning” and believe that the projects provide a more realistic environment for applying the principles of engineering, science and mathematics towards solving practical problems. 2007 Institute for STEM Education and Research.